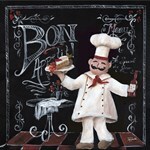 FastFramePrints.com features hundreds of chef art posters that are perfect to hang in any home kitchen or restaurant. FastFramePrints.com offers collections of chef art posters from numberous artists including T.C. Chiu and Dena Marie. Collections range from classic works of art to the more comical chef art, and offer posters for any number of holidays and nationalities. Give your compliments to the chef with chef artwork and prints from FastFramePrints.com. A chef is an artist in his own sense; whether it’s creating a culinary masterpiece or designing a six-course menu. Chef artwork makes an excellent addition to any home and can evoke inspiration in the kitchen. We all love food and wine, so why not show it? When you display your chef art it will be like you have your own personal Italian or French chef. Explore our canvas and framing options to personalize your piece and make it your own. 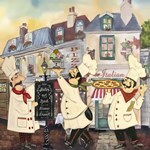 With the large selection of chef artwork available at FastFramePrints.com, you truly can eat, drink and be merry! Shop our selection of chef art and posters today!